As a busy mum, I often forget to give myself a chance to relax in the evenings. My to do list seems never ending, especially as I work from home too. I find it hard to switch off and just relax. 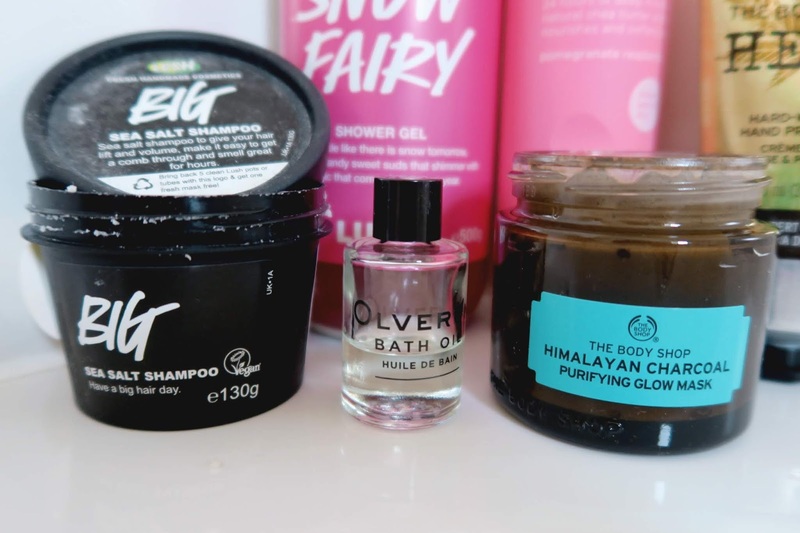 When Olverum got in touch and asked if I wanted to try out their bath oil, I knew that this would be the perfect excuse to dig out my pampering products that have been collecting dust, and maybe discover some new favourites. I'm not someone who uses a million products on a daily basis, in fact I'm trying to get more into skincare and beauty at the moment. I used to be really into beauty and skincare when I was in University, but in recent years, especially since being a Mum, I have really neglected myself when it comes to pampering and wearing make up. That's why I said yes when Olverum asked if I wanted to try their product. 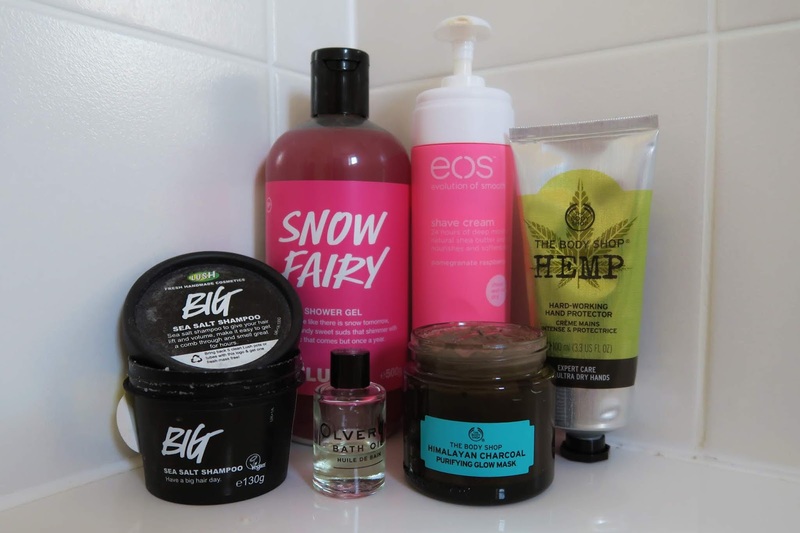 It was a great excuse to lock myself away in the bathroom and try products I've been meaning to try for a while. Lush is one of my favourite places to buy my bath products. I love that they use natural ingredients and that they tell you who made them, and when they made them. Big Sea Salt Shampoo has been a staple in my haircare routine for quite a few years now, and I tend to use it once a week to give my hair a treat. I find the salt really helps to get rid of any dirt buildup in my hair, and it smells amazing. I really feel like a mermaid every time I use it. The salt really helps to exfoliate my hair and I can really feel it working. It is also great for adding volume, something I struggle with. This product is also Vegan. Olverum is definitely a luxury product, and something that I hadn't heard of before. As I said, I haven't really used many bath oils in the past, so I didn't really know what to expect when it came to using this product. I was kindly sent the travel set, which has enough product for 9 baths. The glass bottles are only 15ml so they can easily go in your hand luggage when travelling, and are a great treat after a long day of walking around. You don't need to use much product, just half a capful and your bath transforms into the ultimate spa experience. The unique blend of essential oils smells amazing, and I really found that it relaxed me. In fact I felt myself drifting off a few times! I was worried that it would leave my skin, and the bath greasy, but it didn't at all. I didn't feel anything sitting on my skin which is a different experience to cheaper oils that I have used. I think this would be such an amazing gift for someone as I think everyone forgets to relax sometimes! As soon as I saw this product, I knew that I had to try it. I've only used a few face masks in the past, and they are usually the cheap single pack ones, but I always found that they left my skin feeling amazing. This has to be one of the best masks that I have tried. I love how it dries on my face, and it is so easy to wipe off and remove. I hate it when I have to scrub to get a mask off, but this one simply wipes off with a muslin cloth. I have clear skin anyway, with a spot only appearing every few months, so I always wondered if face masks would benefit my skin. This one definitely does, and it makes it feel more hydrated and even smoother, I really don't know how it manages to do it! Snow Fairy is a limited edition product and is usually released around Christmas time. It is one of my all time favourite products and every time it is released I stock up on a huge bottle. I love all of Lush's shower gels though, and when this one isn't in stock, I'll happily purchase The Olive Branch or Dirty Springwash instead. Snow fairy smells incredible and makes me think of a magical fairy land. It's a very sweet smell so won't be everyone's cup of tea, in fact my husband isn't a fan of it and prefers the other scents that I buy. It is similar to their Rockstar solid soap and the Candy Mountain bubble bar. I first purchased this shaving cream from EOS when I was in Las Vegas for my wedding. I had already tried the EOS lip balms, and was curious about their other products. I knew shaving cream is a bit of a weird thing to bring back from a holiday, but I'm glad I did. This is the best shaving cream that I have used, and I am gutted that I can't get it over here. I always pick some up when I'm in America so that I have some on hand. I find that my legs are really sensitive when it comes to shaving, and I haven't found many products that keep them moisturised during my shave. This product is the one, and the price tag is so small as well. I highly recommend that you try it out if you get the chance. Hand cream is something that I use on a daily basis. I find that my hands get really dry, and due to having a toddler I wash them more than the average person. 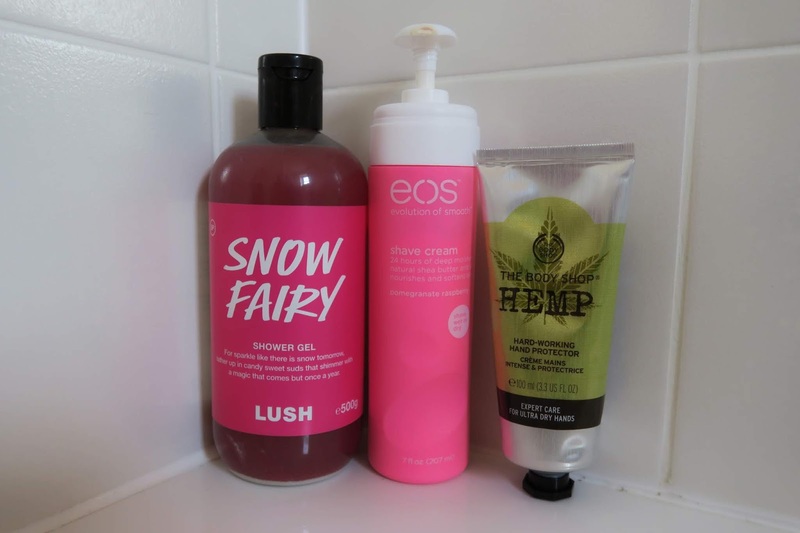 All the washing and drying means that I need a way to keep them hydrated, and I have found that the Hemp Hand Protector from The Body Shop has been the best so far. I do like their other hand creams, but this one just feels more luxurious, and more like it is actually doing something. It doesn't leave my hands greasy, and I also love the packaging as I can squeeze out every last bit of product. It also lasts forever, so I don't mind the price tag. 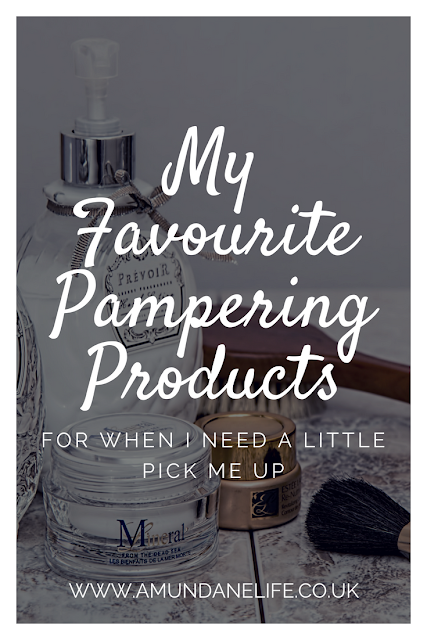 These are all my favourite products to use when I have time for a quick pamper at the moment. I am in the process of organising all my beauty and skincare products, and it is something that I would like to write about more, so stay tuned for more posts like this one! THE OLVERUM PRODUCT FEATURED IN THIS POST IS A PR SAMPLE.